With the launch of a new website for the P.C. Rossin College of Engineering & Applied Science (CEAS), the university has hit a significant milestone: All of Lehigh’s four colleges boast new Drupal websites, thanks to the efforts of the College’s department of communications and marketing in collaboration with Library and Technology Services (LTS). Senior web developers Ashley Ryan and Tom Donahue of LTS Web & Mobile Services completed the redesign project in early December. The new structure consolidates and integrates the College’s Web presence, and that of its eight departments, into an integrated multi-site that enables a collaborative management model and automatic content-sharing across the sites, according to a college statement. 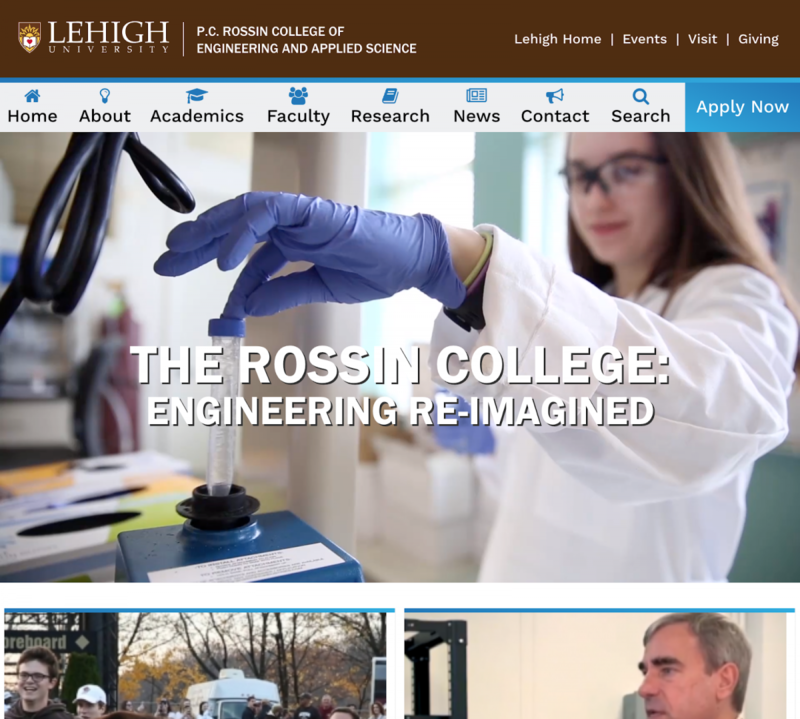 “In redesigning the site, we set out to capture the diversity and the excitement of the engineering experience at Lehigh,” Stephen P. DeWeerth, professor and dean of the Rossin College, said in the statement. Donahue said the College was looking to push boundaries and the team ended up working on content presentation up until launch. “The project was technically challenging, but we developed a solution that was able to exceed our client's expectations,” he said. Ryan agreed. “While the new site may have been one of the most challenging and in-depth projects taken on by the Web & Mobile Services team,” she said, “that also makes it one of the most rewarding." Donahue added: “It's safe to say that we all learned a few lessons and those will only benefit Lehigh for our future builds." Read the full story on the CEAS website.